This page discusses some of the key concepts to dust control in mining starting with dust prevention through to dust suppression. Note that this is a very brief introduction to highlight the concepts only. 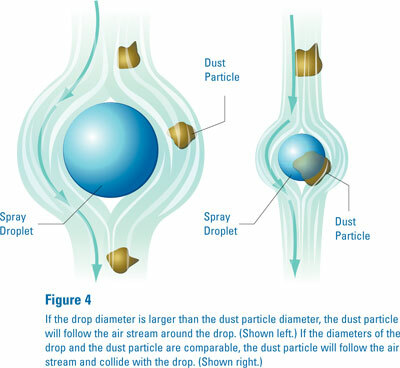 The following image illustrates some different dust particle sizes. A key point here is that visible dust is not a major concern for health, but it is the smaller particles that are generated at the same time. These may not be visible but will travel further and are the major health issue for the community. As a result most dust monitoring is usually focused on the PN10 dust (less than 10 micron) particles. The Dust Extinction Moisture (DEM) level provides a guide on the moisture level required to minimise dust when processing material. 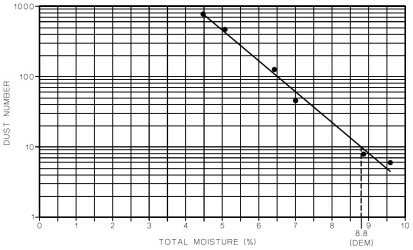 In practice the graph of dust vs moisture level of a material is more useful as it illustrates the impact of adding moisture to the ore. This allows organisations to select an acceptable dust level and an associated target moisture level. The graph produced to determine a DEM are usually logarithmic. It is important to understanding the behaviour of the material with different moisture levels. For example when increasing the moisture level of some materials they will become sticky or clump before they reach their DEM. For these materials this stickiness will cause cause problems with handling of the material, and hence the target moisture level will need to be higher than where this becomes an issue. This is a very complex topic using fluid dynamics principals. When designing a new materials handling system we could encourage you to consult a specialist in this area. The Dust Lift off velocity is particularly relevant to material stockpiles. Understanding the velocity or wind speed at which dust will lift off stockpiles allows better management of stockpile dust control. For example if the weather forecast for the next day has a wind speed above the dust lift off velocity then proactive actions such as wetting or crusting the stockpile can be undertaken to minimise dust lift off. The following is an example of dust lift tests. Dust particles join with water droplets of the same size much more efficiently. Water droplets discharged from nozzles have sizes usually in a typical bell curve (curve max is at centre and falls away at sides). Dust particles also come in a range of sizes and the distribution can be very different to a bell curve as the following real example shows. The selection of spray nozzles for an application should take into consideration the dust particle size distribution. 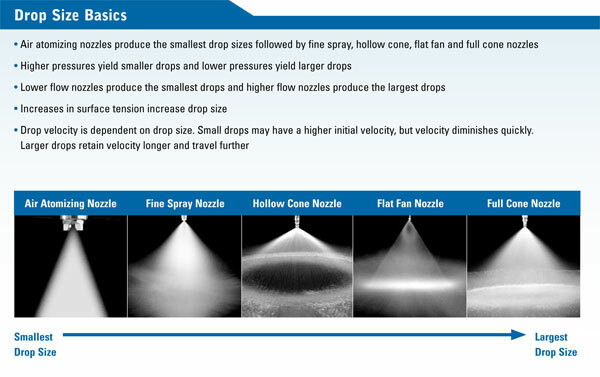 The following extract from the Spraying Systems: A Guide to Spray Technology for Dust Control illustrates the key considerations when selecting a nozzle. It is important to note that matching the nozzle droplet size to the dust particle size is only applicable where the nozzle discharge is close to the dust source. A good example of this is Fog Cannons where the discharge droplet size needs to be larger as the droplet reduces size as it travels due to water droplet break up and evaporation. Some dust types are hydrophobic - the dust particles repel the water droplets. Dust can be hydrophobic to various degrees. When dust is hydrophobic it is harder to increase the material DEM and also makes mist or fog based dust suppression less effective. Wetting agents and agents with ionic charges can be used to reduce the hydrophobic effects of dust. A simple test can be used to see if wetting agents will make a difference. Have 2 glasses of water and put a couple of drops of wetting agent (eg quality dishwashing detergent) into one and gently mix it without creating froth. Sprinkle a small amount of fine dust on the water surface of both glasses and see if there is any different in the time the dust takes to sink. If the dust just sits on the surface and does not sink then it is hydrophobic.